ORCID stands for Open Researcher and Contributor iD. ORCID is a personal ID for researchers like ISBN is for books, ISSN for journals and DOI for articles and data. It provides a unique and persistent identifier for researchers and scholars, connecting you and your research activities throughout your career. ORCID is free, open, mobile, and community-driven. Signing up for an ORCID identifier and using it in your research workflows will ensure that you receive credit for your work. It can also simplify manuscript submissions and improve author search results. You can think of ORCID as the academic equivalent of your passport number. It ensures other research systems and services know who you are. Unlike Google Scholar, Academia.edu, or ResearchGate, ORCID is NOT a research profile system. In fact, having and using an ORCID ID will facilitate the maintenance of researcher profiles that you already have. ORCID is an increasingly important part of the global research infrastructure. Do you worry about getting credit for your research because your name is common or you have publications under multiple aliases (e.g. married name and maiden name)? Do you struggle to keep track of all your research outputs? Are you annoyed by having to enter the same information over and over in manuscript and grant submission systems? To solve these problems, there’s ORCID, the Open Researcher and Contributor ID. ORCID is a registry of unique identifiers for researchers and scholars that is open, non-proprietary, transparent, mobile and community-based. ORCID provides a persistent digital identifier to distinguish you from all other researchers, automatically linking your professional activities. Funding organisations are requesting ORCID iDs during grant submission and plan to use it to reduce the burden of grant submission. Publishers are collecting ORCID iDs during manuscript submission and your ORCID iD becomes a part of your publication’s metadata, making your own work attributable to you and only you. Publishers can also credit peer reviewers by inserting peer review activities to the ORCID record. Professional associations like the Society for Neuroscience and Modern Language Association are incorporating ORCID iDs into membership renewal. Over time, this collaborative effort will reduce the redundant entry of biographical and bibliographical data into multiple systems. Your ORCID iD will belong to you throughout your scholarly career as a persistent identifier to distinguish you from other researchers and ensure consistent, reliable attribution of your work. Maastricht University uses Pure as its Current Research Information System (CRIS). Pure is a curated, trusted source of data within the university, and researchers and institutions can easily associate their research output from Pure with the globally accepted persistent unique identifier ORCID. 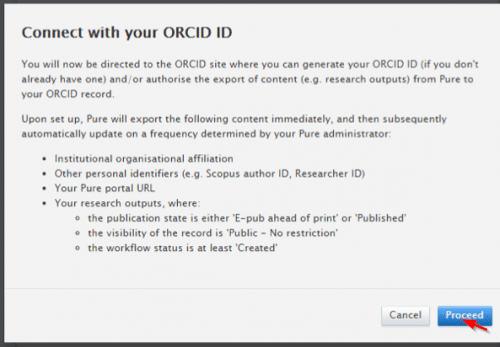 Once you have linked your ORCID to Pure, Pure can automatically add works to your record as a trusted organization, but only after you have authorized Pure to do so. Your publisher may have asked for an ORCID iD when you submitted a publication or you may have already chosen to set up an ORCID profile to promote your research output. As an increasing number of publishers, research funders, and universities adopt ORCID, having your ORCID iD in Pure will maximize the opportunity for system integrations in the future. You can check in the ORCID registry whether you already have registered an ORCID iD. If you do not have an ORCID iD yet, go to 2.a and follow the steps to register an ORCID iD and add it to Pure. 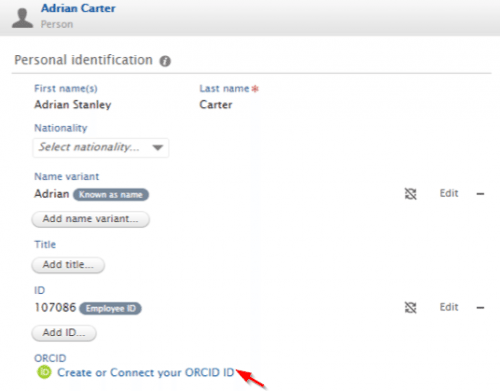 If you already have an ORCID iD, go to 2.b and follow the steps to add your ORCID iD to your Pure profile by connecting once from Pure to Orcid.org. You are directed to the ORCID authorisation screen. If you already have an ORCID ID, be sure not to choose Register Now. This will create a new ORCID! Check the permission box to allow Pure to automatically transfer your new publications to your ORCID account. If you do not check the box, you will have to sync ORCID manually. 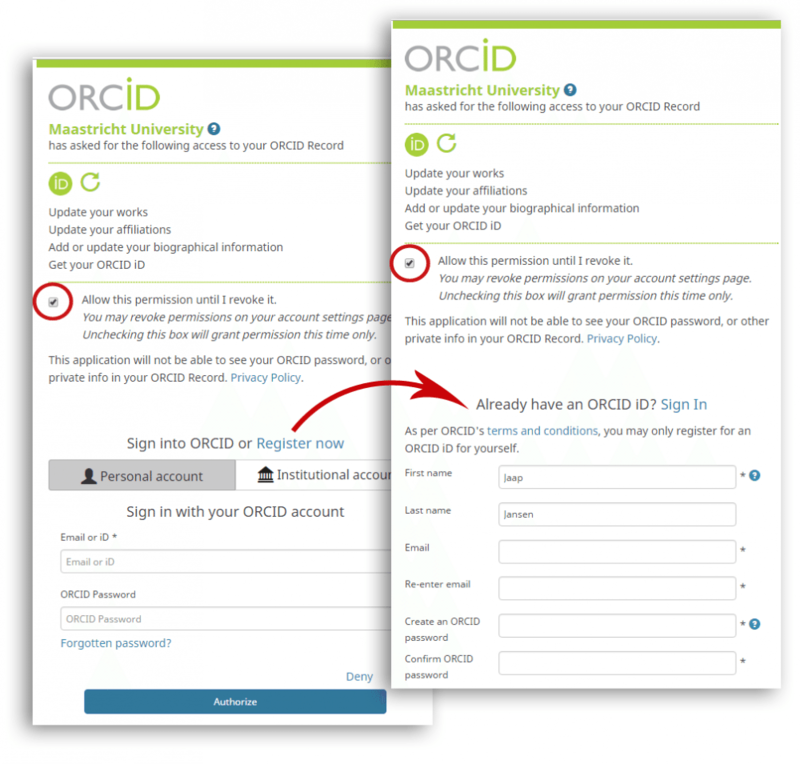 Sign in with your existing ORCID account and authorise the connection between your Pure account and your ORCID account. You are directed to the ORCID authorisation screen. If you do not have an ORCID ID yet, you can register right now. Next, choose Register Now. This will take you to the registration page. Researcher control of ORCID records is one of ORCID’s core principles. You register for your own ORCID iD, and you always have complete control over your ORCID record, including what information is connected to your iD; what is publicly available, private, or shared with trusted third parties; which third parties you share information with; and whether/how often you wish to receive updates from ORCID. Signing in (authentication) ensures that only you can access your ORCID record, and enables you to control permissions to obtain your ID and the data in your record. Because Pure is updated every night and you may want to prevent your email inbox from flooding, we advise you to set the frequency of account and record notifications in your account settings to ‘weekly’ or ‘quarterly’. When you register your ORCID iD, you set the default visibility setting of any data newly added to your ORCID record, either by you or by a trusted organization or a trusted individual: works, funding, affiliation, peer review, identifying information such as keywords, etc. This will not affect any new email addresses added to your record, the default visibility of email addresses is always to only you. You can also update your default visibility setting at any time in the visibility preferences tab of your ORCID Account Settings. Changing the default visibility preferences in your account settings will not overwrite the visibility level of any existing items on your record. To change the visibility of individual items in your record, use the visibility selector next to each item. The only item without a visibility setting on the ORCID record is the ORCID iD, which is always visible to everyone. This enables the record to always have a visible iD so it can be identified and resolvable. Include your ORCID iD in your CV or resume, web page, email signature, business cards and anywhere else you have a public profile. When including your identifier, be sure to use the full URL so that people know it is an ORCID iD and can easily navigate to your account page. This video from Open Science MOOC shows how your digital researcher profile is more than just your ORCID record and which other tools can be linked to ORCID to develop your digital researcher profile even further. Impactstory is an open-source web-based tool that helps researchers explore and share the diverse impacts of all their research products beyond just citations. You can use it to get an idea who is mentioning your work on for example Twitter, Facebook, Wikipedia, or in blog posts, newspapers or videos and where that happens. Publons is a website and free service for researchers to track, verify and display their peer review and editorial contributions for academic journals. Publons produces a verified record of a person’s review and editorial activity for journals. This evidence is displayed on reviewers’ online profiles and can be downloaded to include in, for example, CVs, funding applications, and promotion and performance evaluations. In addition, you can import your publications in Publons and get an overview of your impact over time. Open Science Framework (OSF) is a free, open source web application that connects and supports the research workflow, enabling scientists to increase the efficiency and effectiveness of their research. 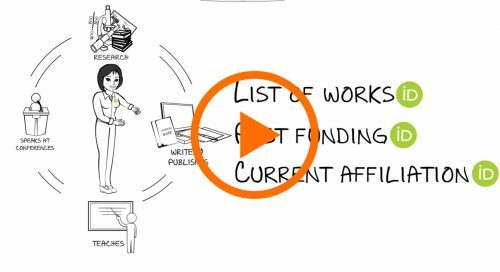 Researchers use OSF to collaborate, document, archive, share, and register research projects (i.e. pre-registration), materials, and data. Researchers can use OSF to manage their projects and collaborations or register their studies. OSF makes all the manuscripts, unpublished findings, materials and in-progress work that you share citable so that your impact is measured and you get credit for your work. Join our Research Support mailing list and receive our monthly update about services, support, apps and tools, practices, training, and trends with a focus on research. You have successfully subscribed! Watch your inbox for a confirmation message. Your subscription starts after your confirmation. We would like to hear your feedback about this tool. You can also use this form to contact Mariëlle or Ron for ORCID support.